Are you a fan of extra side keys, like on the LG G7 and Galaxy S9? What does this button do? That's a question that has led to many glorious discoveries, and even more disasters, but man's curious nature can not be deterred by a mishap or two, caused by inadvertently pressed buttons. The fans of clicky physical keys have a lot to celebrate with Android's flagships this season, as both the Galaxy S9 and the LG G7 shipped with extra side buttons, in addition to the usual power/lock keys, and volume rockers. Both frame usurpers are used to launch digital butlers - Samsung's own Bixby, or Google's Assistant - but we know you are clamoring to know whether those side keys can be mapped to something more useful. 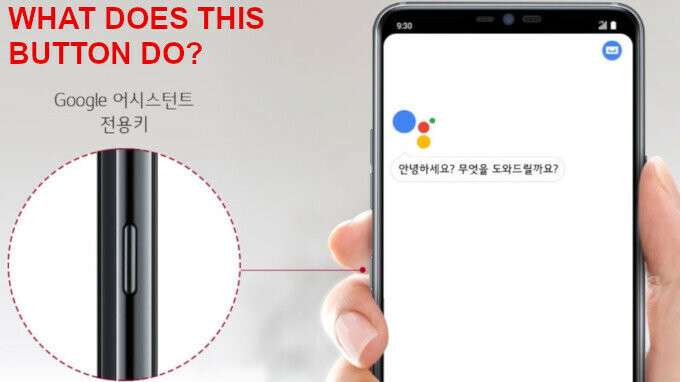 Well, not very easily, and LG told us during the prebriefing that you will be able to turn on and off the Assistant function at launch, yet they will be listening to feedback fro users, and provide different side key mapping options if that ends up being the prevalent popular opinion. That is why we wanted to ask you of you are a fan of those extra physical side keys that are wiggling their way in this season's flagships. Take your pick in the poll below, and tell us what would you like to see such buttons do? Oh, yeah, baby, press for assistance! Sony's is a great button for the camera. But hey I will take any extra button or squeeze feature, if there is an added benefit. Plus allowing users to change the button usage is even better. Agreed. I really miss it on my G6, it's the best implementation of a side button imo. Edit: for those who don't know, it's a two-staged button, so you can focus and unfocus. So the volume keys can't replace it. Blackberry got it right on the Keyone. The first choice here. It's a little annoying to accidentally hit said button to open something you don't want. Instead of adding more buttons, I think more manufacturers should follow Motorola's strategy. The last 5 Motorola phones I have owned (I buy a new phone once per year) have all had extra functionality by using the accelerometer. Activating the camera, flashlight, and even silencing the phone during meetings can all be done by moving the phone in a certain fashion rather than dirtying up the phone with extra buttons. I use the camera one at least once a day (Much faster than unlocking and tapping the screen. I simply take my phone out of my pocket and twist my wrist as I bring it up to take the shot.) I also use the flashlight at least once a day. (Same thing only slightly different hand motion.) I much prefer a new creative use of hardware that is already installed than to add more to only have a dedicated use. I don't like the extra buttons. Reminds me of some years ago when there were dedicated buttons for answer, hang-up, and some other functions. The G1 comes to mind. Agreed. Only useful buttons please. Nothing beats physical send/end buttons. If it means having notches at all 4 corners, so be it. If it can be mapped to another function like opening the camera app/taking picture, that would be nice. Also, a dedicated button to open google assistant wouldn't be the worst option. I have to wake my phone and hold down the home button which takes a couple of seconds. Just make all extra buttons remappable or they could place it where sony xperias have them for quick camera shots. The HTC/Google squeeze feature is still the best way to do it IMO.